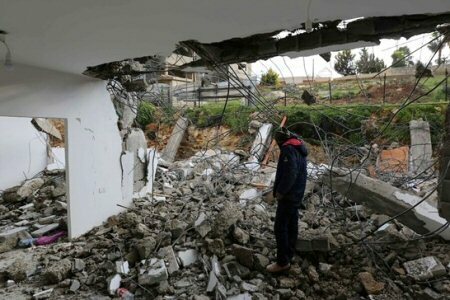 In January, about 40 Palestinian-owned structures were demolished or seized by Israeli authorities — almost the same as the monthly average recorded in 2018 — displacing 44 people and otherwise affecting some 200 others, the United Nations Office for the Coordination of Humanitarian Affairs (OCHA) in the occupied Palestinian territory said, in its monthly report. In OCHA’s report on West Bank demolitions and displacement, one of the demolitions reportedly took place on punitive grounds, and the remainder occurred due to the lack of Israeli-issued building permits, which are almost impossible to obtain. Over 70% of the structures targeted, this month, were in 11 communities in Area C of the occupied West Bank, which is under total Israeli military rule. In one of them, in Beit Iksa, Jerusalem area, the livelihoods of 50 people were affected by the demolition of four animal structures, a cesspool and the walls surrounding one home, with losses estimated at over 1.25 million shekels (303,000 euro). Beit Iksa (app. 1,700 residents) is one of other “dislocated” Palestinian communities in the Jerusalem area that have been physically separated from the rest of the West Bank by the segregation barrier, but residents are not allowed to enter East Jerusalem. In al-Simiya village, in the Hebron district of the southern West Bank, three tents provided by the Palestinian Ministry of Education, to serve as a school, were seized, affecting 45 children. This is the third time in four weeks that structures for this school have been seized. At Imreiha village, in the Jenin district of the northern West Bank, also in Area C, two structures funded by the European Union and its member states, including a home and a mobile latrine, were seized and as a result, four people were displaced. In East Jerusalem, ten structures were targeted during January, less than the monthly average of 15 recorded in 2018. Additionally, a Palestinian refugee family became at heightened risk of forced eviction from its home, following an Israeli court ruling in favor of a settler organization claiming ownership over the land. The home is located in the Sheikh Jarrah neighborhood, where the family was settled, with the support of the United Nations and the Jordanian government, in the 1950s. At least 870 Palestinians in East Jerusalem have pending eviction cases filed mainly by settler organizations. Also, this month, the Israeli army blew up an apartment in the town of Yatta, in Area A, which is under full Palestinian control, on punitive grounds. The apartment was home to a Palestinian who stabbed and killed an Israeli settler, in September 2018, and was detained, after he was shot and injured.